Beach Cleanup at Pukerua Bay: come and help clean up our amazing stretch of coastline! This event is organised by Kathmandu and Sustainable Coastlines, and they would like you to sign up as a volunteer here if you wish to participate. Sturdy, closed-toe shoes that you don’t mind getting a bit muddy. This is critical for health & safety: those not wearing closed-toe shoes will not be able to participate. Your old or unused mobile phone to recycle. As a charity partner of the RE:MOBILE phone recycling scheme, donating your old mobile helps us raise critical funds for freshwater restoration. A camera (optional). We would love to see your event photos! If you use Instagram, use the tags #loveyourwater, @kathmandugear and @sustainablecoastlines to let the world know. It’s been a busy month in the community garden — we’ve had three working bees and made a lot of progress. mulched around all the trees to keep down weeds and help the soil retain water over the driest part of the year. We still have to put in some wind breaks by the trees to protect them from the wind that comes from the northwest, which can be pretty strong at times. Of course, we’ll need to keep the grass down, but we’ve got a scythe and some keen users so we can do it without disturbing the neighbours with noisy machinery. Spring and summer will be busy with making sure the trees are OK, and well watered during the dry season. Fortunately, the council installed a tap for us when they built the access onto the site, so we have a permanent and reliable water supply. We also have to start planting the smaller support plants, which will help accumulate minerals for the trees and build up the soil health, and we’d also like to get some berry plants in there, too. We’re trying to follow permaculture principles to create an ecosystem that has a wide range of plants, soil biota and insects that all support each other. 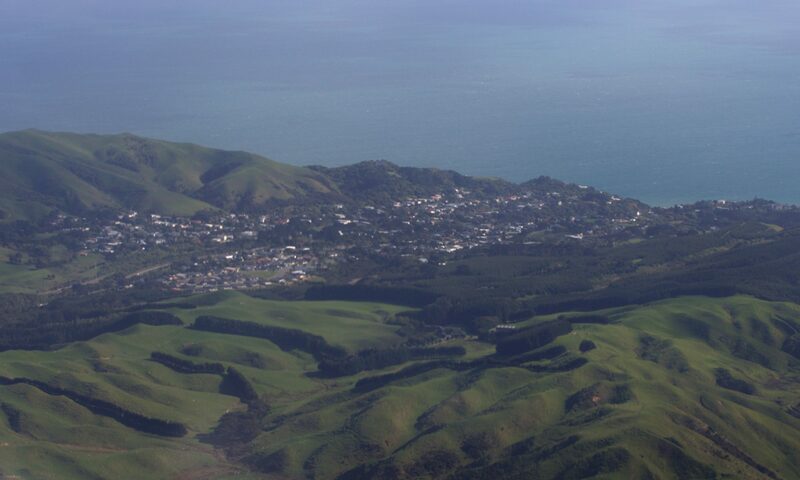 It looks like we have got more funding from Porirua City Council under their Village Planning programme again this year, so we’ll be able to do more planting over the next 12 months. We’ll look at establishing a different range of plants from the pipfruit trees we’ve planted so far — perhaps more stone fruit, or maybe some citrus. We can’t wait! Next Thursday (14 June) at 10.30 am, Pukerua Bay School children will be planting the area around the new Kororā (Little Blue Penguin) sign on the beach, at the start of the coastal walk track. The sign is for promoting the protection and conservation of the penguins. Wondrous news, the interior of the Community and School Hall is finally getting a long overdue paint! But first, we need to get rid of all the staples. Please could we have help? There will be a working bee at the hall on Sunday 6 May from 2-4pm. If you can come, please bring your own staple-removal tools, and bring your taste and good judgement, because there will be a chance to help choose the colours. Thanks in advance, from the Hall Committee and Board of Trustees. We planted 30 trees today, mostly tagasaste, which fixes nitrogen and helps to improve the soil, and can later be be coppiced for firewood and sacrificial mulch. It will serve to shelter the holly oaks while they get established to form the main long-term shelter. We even managed to sneak some lavender amongst proceedings too. Many thanks to everyone who turned up to help!